This week saw the challenge between the captain’s and president’s teams. Played in pairs, each pair added their combined stableford scores together. This was matchplay with the best team scoring one point. It was in the balance until the last game (match 8). With both teams on 3.5 points, Paul Douglas & Eamonn Barry overcame Ken and Alicia Saunders to give a captain’s team a narrow victory. Graham’s team seemed beset with bad luck throughout, with 2 of his teams starting a player short through last minute withdrawals. This was overcome with the sole player having their score doubled. In Mick Parson’s case this proved enough to win his game but not so for John Carson. Also both Graham & Noel Brady were unable to complete the 18 holes due to injury, which unfortunately put paid to their team’s chances. However, it was a fun day and the competition was secondary to enjoying the company, sunshine and golf. Myself and Graham went out first and were privileged to play with Andy Scrimshaw and Matty Webb fresh from the Hi5 tour competition at Hacienda Riquelme. Andy followed up his magnificent 67 on the final day there with a spectacular display of rescue play. Although missing greens with his approaches he consistently got up and down from bunkers and rough. On the other hand, Matty was smashing drives long and straight, hitting greens, but struggled with the putts – it seemed every one hit the lip and came out. Thanks for the lesson guys! 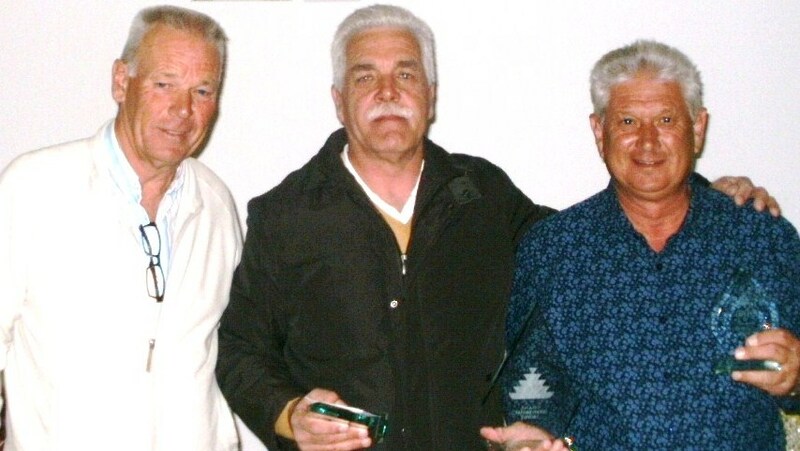 Prizes for the best team on each side went to Mick Parsons (president) and Paul Douglas/Eamonn Barry (captain). All members of the winning team received a medal from the vice captain Kevin Smith who made the presentation. The ladies nearest the pin (3rd) and nearest in 2 (15th) were both won by Jane Turner (handicap +1). Men’s nearest the pin (17th) was George Hoskins and nearest in 2 (15th) was David Dale. Next week is the Apollo Air monthly stableford, followed on Monday March 5th by the Global Golf sponsored stableford. As they will be giving the prizes there will be no entry fee. Wednesday night roll up is still at the Condado Club at 7pm but on Friday the presentation will be in the Clover at 5pm. All future meetings will be back at the Clover. Today is the last day to nominate anyone for committee, or propose a motion to be discussed at the AGM. This takes place on Wednesday March 7th at 7pm in the Condado Club. Email the secretary at cath@cdagolf.com. Membership is due for renewal March 1st but anyone who has been a member in 2011/12 is entitled to attend and vote. Sorry for the delay but my laptop has been down for nearly a week. This week we had 10 teams in the 4 person 1,2,3 waltz. Unfortunately 2 players did not show so 2 teams had to cope with 3 players. Again it was a popular format with the weather favouring the players. Next week is a fun comp between the Captain & President’s teams. It will be a matchplay pairs with each player playing individual stableford then team scores added together. The winning team in each match will get one point, halved matches half a point. 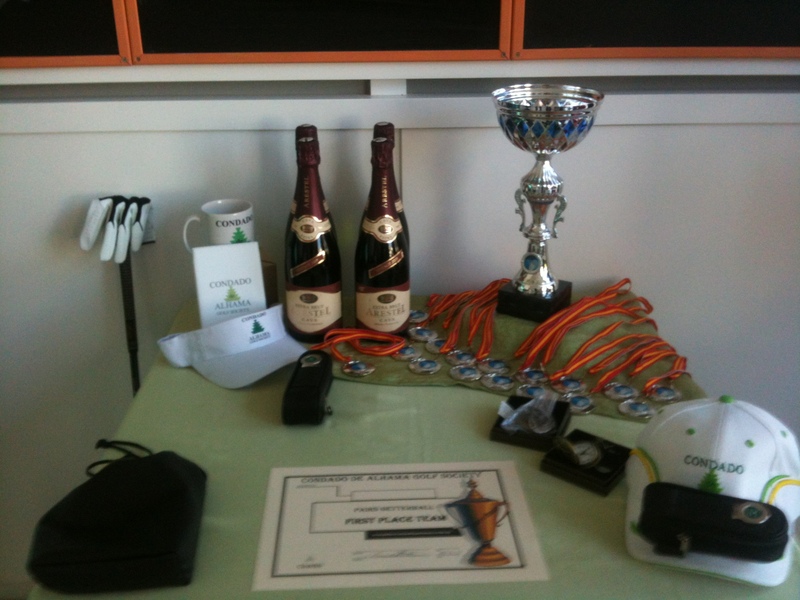 We have an annual trophy to play for and momentos for the members of the winning team. Global Golf have supplied a trophy for their March 5th competition and will also supply prizes. Following a meeting between Dave Lloyd, Graham White, Jan Skjold and Jan H Olsen the Viking Cup this year has been modified to allow the inclusion of Irish players on the UK side and Swedish & Danish players on the Norwegian side. I hope this is acceptable to those who have felt excluded in the past. Last week myself and Graham made an informal visit to the new course at Lorca. We spoke to the course director who was keen to get our society to play the course. We did try to get the same deal as at Hacienda del Alamo (which they also manage) but it seems that would be subject to making at least 2 society bookings a year. Then if we bring at least 20 players we can have a walking rate of 30 euros or 35 euros with a buggy. The course is not as long as Condado but looks interesting, and has a small but very nice clubhouse overlooking the course. We shall perhaps arrange a couple of away days this summer. It is your last chance to submit items for the AGM on Wednesday March 7th (7pm in the Condado Club). All nominations for committee or motions for discussion should be sent to the secretary at cath@cdagolf.com by Tuesday February 22nd. I will post the items for discussion on this website and on the noticeboard after the deadline date has expired. This week was the monthly Apollo Air trophy and 34 players (including 8 ladies) played an individual bogey competition. Also we had two professionals with us from the Hi5 tour having just finished an event at Hacienda del Alamo. This was a plus/minus score against par on each hole and there were some good scores, which reflected the sunny, practically windless conditions. The start was delayed until 10.30 because of frost, which had blanketed the course 2 hours earlier. Barry Answer looked out of place in his shorts on the 1st tee (but he was on holiday! ), but by the time we reached the 18th everyone else looked overdressed in the warm sunshine. Next week is a 4 person team 1,2,3 waltz which was enjoyed by all last time out. Global Golf have confirmed that we can organise a competition in their name on Monday March 5th. They will provide the prizes. Again a reminder that nominations for committee must be given to the secretary at cath@cdagolf.com. The same applies for any motions to be discussed. Below is the agenda for the AGM. This week was the 2nd playing of the Anniversary Trophy, marking 2 years since the society was formed. At the 1st meeting there were about a dozen players in the Clover. At the end of the 1st year 400 golfers had played in the society, and now we have over 800 members – a great success story! Conditions for the competition were horrendous – ice had formed in the pools in the car park and also around the edges of the lake. However, the anticipated delay in the 10am start did not materialise, and players were off on time with enough clothing on for an arctic expedition! 44 players started off but 5 of them succumbed to the severe conditions and left the course at half way. There probably would have been more deserters but for the fact it was a major trophy event. The difficult conditions were exacerbated by an icy gale force wind, which often blew stationary balls off the greens. Players often saw a good approach run up to the pin, and by the time they got to the green they would find a seemingly good shot 30ft away, with a tricky putt awaiting them. I think the conditions were the worst I have experienced in the 2 years that the course has been open. We had a professional from the Hi5 tour playing with us (off the back tees I may add) and on the 6th hole into the wind he hit 2 drivers and was still short! A wedge would probably be his normal choice for his 2nd shot. However, that said the wind was not always against – on the par 4 1st, 12th and 15th holes I was left with a chip to the green. On the 15th I played a chip and run and saw my ball run past the flag, up into rough, and then roll back onto the green. As I turned to put my club away I heard a cheer as it ran back into the hole for an eagle 2! Perhaps that was the bit of luck myself and my partner Robin needed as we went on to win by one shot! 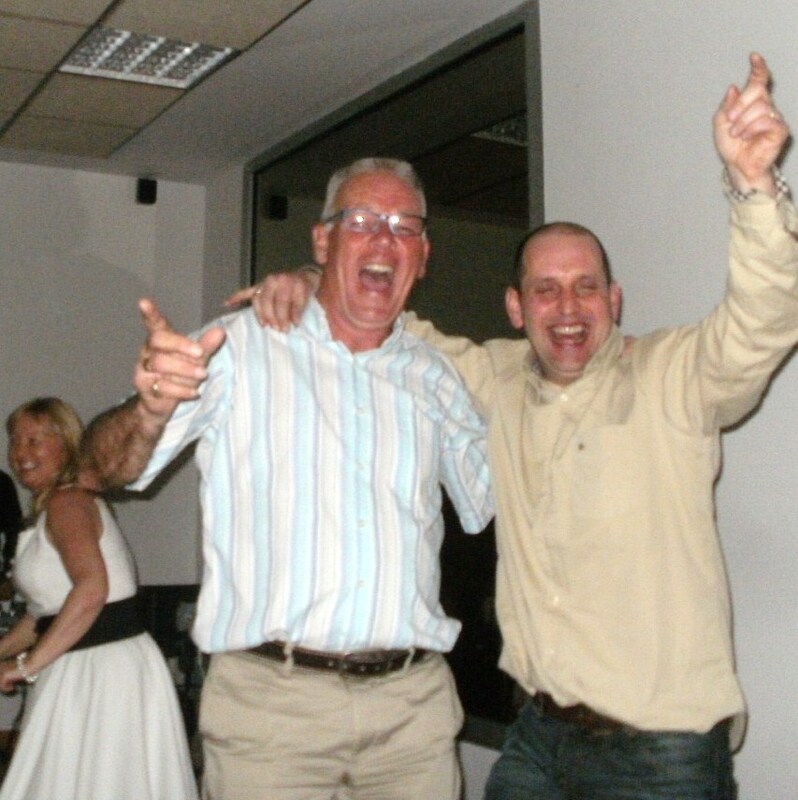 Robin was an excellent partner and he has an unusual style – he is right handed but plays with left-handed clubs. He grips the club cack-handed and back hands the ball down the fairway very accurately! Also he only uses irons proving there are many ways to skin a cat! The cold weather of the last two weeks has resulted in two of our members becoming devotees of spanish brandy – last week it was Kim Lloyd and this week Cath Jenkins, who despite saying the did not like brandy had a couple of good sized shots from my hip flask! The presentation at night was another success thanks to our organisers Cath and Kevin. 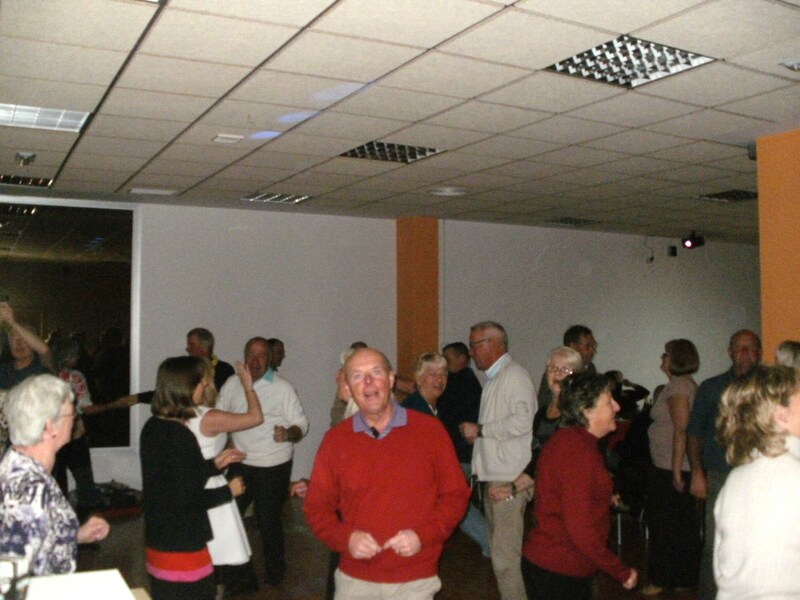 Over 60 people attended at the Condado club, with an excellent buffet being provided by the Condado team. 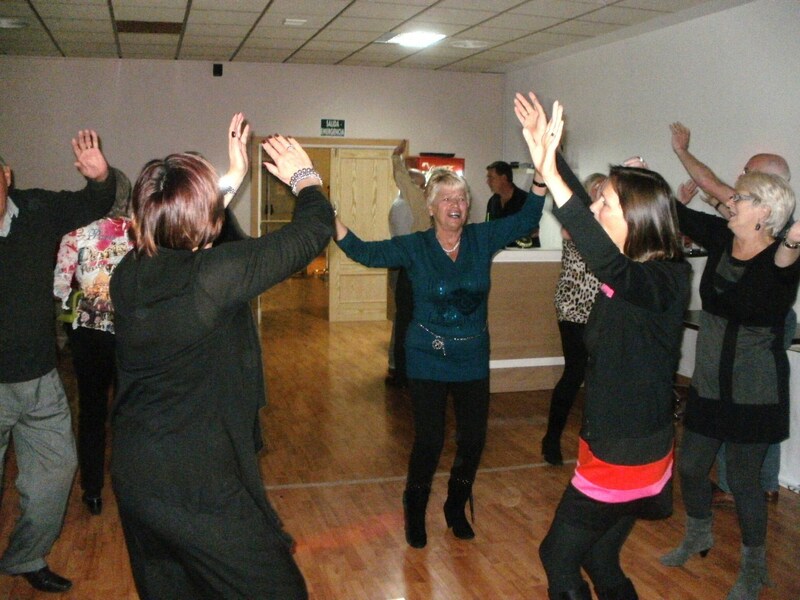 This was followed by a disco and karaoke and as you can see from the photos, everyone enjoyed the night. Thanks to Dave and Kim for providing many of the competition prizes on offer. Also we had our usual freee draw for all the players who were present on the night. More prizes were on offer to all the guests (who handed their numbered entry ticket in). To mark the 2nd anniversary the committee decided to give 3 money prizes from a members draw. Collect your winnings From Phil next time you are on Condado. Next week is the monthly Apollo Air trophy, but this time it will be a modified bogey competition ( where you mark plus or minus to par on each hole). It looks like there is some movement on the temporary clubhouse. Several metal stakes have been placed in the ground between the buggy shed and the practice putting green (not on the land between the white competition tee on the 1st and the practice area as we thought). If this is to be the site the the views from the upper terrace should be quite good. Lets hope there is some more progress shortly. Remember the cut off date for applications for committee and any motions to be discussed at the AGM is February 22nd. One of our members (Ian Field) and his wife Jane have just moved to Condado permanently and Ian has set up a business which may be of interest to our golfers. Anyone who wants to improve their fitness to be able to play better golf – CDA Fitness can help. Ian is REPS & EREPS fully qualified and insured personal trainer living here on Condado.As you know golf ia particularly physical game and you need to be fit and have a good level of flexibility to be able to enjoy it and get the most out of your game.Ian can help by devising a personal fitness programme designed to improve your stamina and fitness levels whilst giving you greater flexibilty in your movements which will mean a better game – longer drives, improved accuracy, better consistency and a lower handicap! All leading to better enjoyment of your game. Ian is also qualified to take GP and self referrals and can help with such conditions as: Lower back problems, Coronary heart disease, Hypertension (High blood pressure, Diabetes, Obesity, Pulmonary Diseases, Osteoporosis, Arthritis, hip and knee replacements and Stress. For more details visit http://www.cdafitness.co.uk. Telephone 0034 634304087.